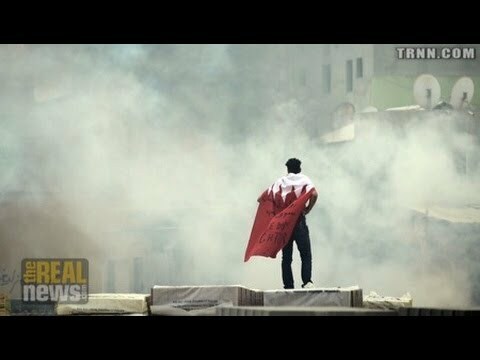 In Bahrain, the repression continues and the struggle against it intensifies. It’s a story you don’t see too much in the Western media anymore, but it’s certainly a story that continues to boil. Now joining us from Bahrain is Reem Khalifa. She’s an independent journalist who works with international newswires. She joins us now from Bahrain. Thanks for joining us, Reem. REEM KHALIFA, BAHRAINI JOURNALIST: Thanks, Paul. JAY: So bring us up to date on what’s been happening in the last couple of weeks. KHALIFA: Too many things, including we witnessed heavy clashes [incompr.] capital, Manama, after the Ashura religious ceremony, which is usually held every year for the majority Shia in Bahrain. There were protesters who tried to or attempted to go to the Pearl Square, where usually they used to gather 22 months ago, before the crackdown. Also, on 23 November, there was the BICI report anniversary, which was even mentioned by many Western governments, including the State Department, about how far the government of Bahrain went in implementing the recommendations of the report. As we see, there was a lot of feedback against Bahrain in regards of the recommendation, applying the recommendation, and also the feedback that came of the government of Bahrain. And this time as well we saw that there wasâ€”like, in the past ten days, there was no, really, sort of clashes happening, because of the religious ceremony that was held in many parts of the island. And also the government announced a state emergency law on October 30. And as a result, we saw one of the announcements that was made stripping 31 citizenships from Bahraini nationals. And this, actually, practice was always been in Bahrain since 1954, and it started with the Sunni members, and now we are witnessing the Shia. And this happened also in the ’50s, in the ’70s, in the ’80s, and in the ’90s. And now we are witnessing in this time. JAY: Now, just to be clear, these are people who are born in Bahrain and then get stripped of their citizenship. So what’s the excuse or rationale for that? KHALIFA: All of them are from one sect. They’re all Shia. They’re all Bahrainis. Some of them, they have Arab background. Some of them are mixed with Persian background. But they’re all Bahrainis. And they come from different professionsâ€”lawyers, ex-MPs, professors. The question is, until now we did not see any one of these family members getting deported. But, for example, the lawyer Taymoor Karimi, who we interviewed, he did mention just a few days ago that he was asked to leave the court because he’s not Bahraini anymore, as an order came out from a higher official asking him to leave the court area because he’s not Bahraini. JAY: And what’s the government’s excuse of stripping him of his citizenship? What is he supposed to have done? KHALIFA: The order came from the minister of interior, according to the state news agency and what was published in the local media, and also was taken by the international media, but according to the Bahraini Constitution and according to the law and to the lawyers in Bahrain, that this order has to come from a highest person in the government, which is the king himself. So they said this can’t be implemented according to the Bahraini law and according to some of the subject in the Bahraini law. JAY: Now, some people, including journalists, have been fined. What are these fines about? KHALIFA: I was among these journalists. And evenâ€”you know, it’s just different professions are paying for their professions, doing their job, and some are paying for their political abuse, or some paying for their background or sect or whatever. It’s just there is a long list of accusation against many group of Bahraini society or members in the Bahraini society. It’s against human rights principles, which are universal principles. JAY: And these areâ€”and it includes journalists. These areâ€”journalists are being fined for what? What’s the excuse? KHALIFA: Well, you know, many of these cases are fabricated. It’s the same thing, what happened to many professions. So if you’re doing your job, they just come andâ€”it just happened to be with my case that we witnessed too many things happen, many crimes, many things, whether journalists or doctors. Happened to me and my family, so we had to pay for that. So my case was fabricated, and everybody believes that. And I believe that as well. But I think this is the price I’m paying for my work, which I really love. JAY: In much of the Western media, this story, what’s happening in Bahrain, is being depicted as a Shia uprising inspired by Iran, and that the monarchy and government of Bahrain are suppressing this in order toâ€”as part of this containment-of-Iran strategy. That’s the first part of my question. And then part two is: where do you think all this is headed? But start with the issue of Iran first. KHALIFA: It’sâ€”unfortunately, the way how they portrayed the upraising in Bahrain gave this look about the connection with Iran. But the problem in Bahrain goes back even before 2011, before the Arab Spring. It is a very long-rooted political problem in the island, and generation after generation is paying for this as a result of absence of democracy and freedom of expression. The problem is not sectarian, as it is promoted or portrayed. The problem is very internal. Bahrainis, like many Arab nations, are demanding democracy, human rights, a political system. If you go and ask, any ordinary will tell you, we don’t really care what type of political system we would like to have, as long [as] we obtain our full rights as citizenship, treated as a citizenship. Coming also to the subject about Iran and Bahrain, I mean, this is political; it’s not sectarian. Political is because it’s a very long-rooted problem in the island, and it goes back to the ’70s, and it started when the parliament was dissolved in 1975 and the country went on emergency law for 30 years. JAY: When the Egyptian revolution took place and the fall of Mubarak, there must have been a lot of enthusiasm amongst the Bahrainis who were rebelling, and they must have thought there would be some solidarity, some support coming from Egypt. But in the recent past, some Bahraini activists tried to go to Egypt, I guess, partly for refuge, and the Egyptians wouldn’t let them in. What was the significance of that? Obviously, what’s happening in Egypt right now, it will have a strong impact not just on Bahrain, but in the [incompr.] region. As you know, Egypt is a very influential country in the Arab world, and anything that will happen in Egypt obviously will affect everybody. JAY: Just finally, how explosive is the situation in Bahrain? Where is this headed? KHALIFA: The violence is increasing. I think observers in Bahrain believes very much that if there is no true, meaningful dialog and a solution, then security solution won’t be the right approach to end the crisis in Bahrain. It might radicalize the situation, and we might witness a new form of groups appearing in a later stage, which wouldn’t really make anybody happy, including, you know, the friends of Bahrain in the Western world. So it is better to solve the situation now and to accept the fact that there wereâ€”problems were committed against people asking for their rights. JAY: Alright. Thanks very much for joining us, Reem. Reem Khalifa writes on Bahraini matters for the Associated Press and weekly op-eds for Qatari Al Raya and Bahraini Al Wasat on Middle East and North Africa affairs.